Growing up, knitting was for Grandmothers. Not being age-ist; It just was. Yarn tangled into an afghan meant Grandmothers in rockers and the need for silence within ten feet of the chair. Now I’ve been watching “Outlander,” a series of television episodes based on a series of books, and yarn arts were not just for grannies, apparently, but also for Highlanders, which makes them all the more endearing. Highlanders, I mean; grandmothers were already at the apex of Endearing. Back to Outlander, in which the ladies wear fabulous knitted things that “Can’t be THAT hard to make.” And who needed to prove that? Surprisingly, Competitive little me, who knew? Didn’t know I had the Competitive/I Can Do Anything with Google gene. I’ve knitted before. I tried socks, which is using dental floss and long toothpicks in order to create one jillion tiny stitches to make toe warmers. Next I tried scarves. Umpteens of scarves. I had enough scarves for necks of a whole herd of pack animals. The cows across the street? The whole crew got a fetchingly colorful tie for their meaty throats, but not a one stood long enough for a quick twist of the yarn around their gullets. Whatever. Now the scarves are stuffed into the nethers of my closet, probably to be trashed next time I read Tidying Up. Last year I attempted a Super Quick Bulky Blanket, but I didn’t have enough yardage of fluffy three-ply yarn and after gripping those enormous needles the width of a Sequoia sapling I gave up the whole shebang. My hands needed rest. Fast forward to this winter, when I’ve conveniently forgotten the pain, angst, and curse words of last year. I need an Outlandish item, and by golly, I shall have it! One perusal of the ‘Net, an arduous trip to Hobby Lobby, as Bubs is not a fan of crafting — and one subsequent trip to Wal-de-Mort, the store that must not be shopped, because I was remiss with my first shopping list and noticed on Sunday, which happens be Hob Lob’s rest — and suddenly I’m a winter knitter. 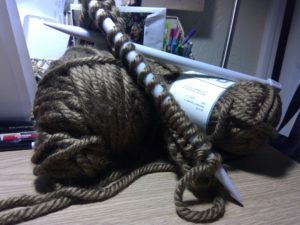 Now I can actually WATCH the show, and KNIT the thingie I like on the screen, in theory. (In actuality, if I look away from my knittin’ hands, I lose stitches, and even when it’s the simplest stitch ever, ever, ever, this chick is a novice. I don’t know how to fix dropped stitches; I haven’t Googled that yet; don’t have the patience to fix it — I just unravel the whole mess, finish watching the Outlander episode, and call the evening a wash. I realize the blessing of having sat with my dog in front of a fire beneath a knot of yarn yet to be re-spooled. Though I cursed a little tiny bit, and though I may not have a traveling shawl, or a pair of fingerless gardening gloves, or a horse ridin’ shawl, but the night was splendid and there’s always tomorrow. To start again. Unless Spring comes before settle back in, with the dog and a bag of yarn, intent on finishing the thing I’m knitting. That’s a real possibility.